The Fellowship was fortunate enough to obtain a copy of VAMPIRELLA #1 from Dynamite Entertainment. The story is by Kate Leth, with art by Eman Casallos, colors by Valentina Pinto, and lettering by Erica Schultz. Vampirella has moved to Hollywood (unusual choice) and Coleridge has found the perfect house for her. The first night at her new home, Vampy receives a “visitor.” The attacker is quickly dealt with, but someone captured it all and posted it on the internet. Now she has two problems: 1.) Why was she attacked and who’s behind it? 2.) How will she deal with the horrors of…social media? VAMPIRELLA #1 is a part of the “Women of Dynamite” revamp spear-headed by Gail Simone. Initially wasn’t a fan of Vampy’s new outfit, but slowly coming around. 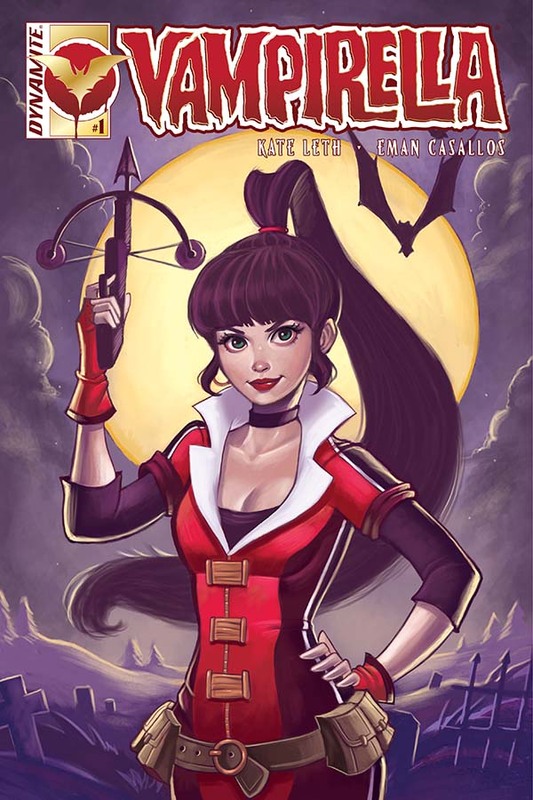 Kate Leth is a very good writer, and it will be interesting to see what she does with Vampirella and friends. If this issue is any indication, Eman Casallos will be having some fun with this series. I really enjoyed his work on MASKS 2. Valentina Pinto and Erica Schultz are solid as always. This is a nice introductory issue to what could be an amazing book. VAMPIRELLA #1 is in stores now, or available for ordering at www.dynamite.com.